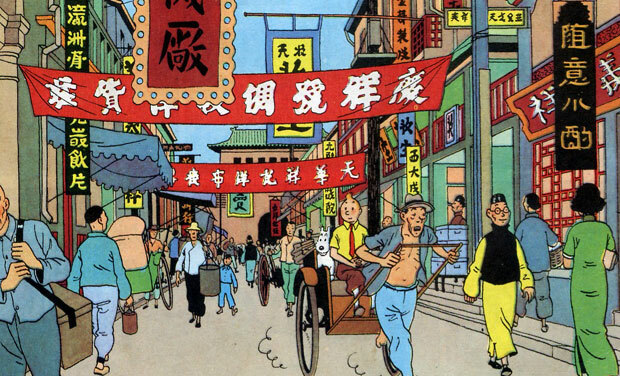 Like most French people my age, as a child, I was a fan of Tintin’s adventures and the scene in which Tintin rides a rickshaw in China in The Blue Lotus left a strong impression on me. It made me want to travel to Asia, but also led me to a huge misconception: until quite recently, I thought the rickshaw was originally from China, but it was actually invented in Japan! The word ‘rickshaw’ itself comes from the Japanese word 人力車, jinrikisha, which can be translated as ‘human-powered vehicle’. During the 17th century, the shogun Tokugawa Ieyasu, who was ruling the country, put a ban on all wheeled vehicles. In feudal Japan, two similar human-powered vehicles (without wheels) were in use, but they required two people to carry them: the kago, a litter for commoners, and the norimono, the Japanese palanquin for higher class citizens. With the end of the Edo period and the beginning of the Meiji period in 1868, the ban was lifted, and almost immediately, in 1869, the rickshaw was invented in Tokyo. It is still unclear today who actually invented it – there are several theories, but even the most credited one is subject to disputes. Today, it is still possible to ride a rickshaw in Japan in traditional and touristic places such as Asakusa in Tokyo or Higashiyama in Kyoto for example. The modern shafu (that’s how rickshaw drivers are called) also double as guides, often with a jolly character. That is why I’ve decided to interview a rickshaw driver working in Asakusa, as I was curious about their lifestyle and the motivation for wanting to do such a hard job! Rickshaws in use today by the company EBISUYA in Asakusa, Tokyo. Mister Taira works in Asakusa for the highest rated rickshaw company on Tripadvisor, EBISUYA, who kindly accommodated my request for an interview. Like most rickshaw drivers, Mister Taira is a smiling , easy-going young man. His love for communicating with people is genuine; before we started the interview, he was the one asking me many questions, curious about my own background . He also speaks very good English – the whole interview was conducted in English only! I was expecting a casual interview about the life of a rickshaw driver and the beauties of the Asakusa area; but little did I know that the stories about his job would move me so much… Read on to know why. Hello, could you please introduce yourself to our readers? T: My name is Tsunenobu Taira, it’s really difficult to pronounce my name in English! I’ve been doing the job of rickshaw driver at EBISUYA for over ten years, and I started it in Kyoto. How did you decide to do this job? T: Not really seriously, actually! I lived in Kyoto, near Gion district. One day, a friend and I were walking around and we saw a rickshaw. My friend said ‘That’s the best job for you!”, because I didn’t have a job at the time. I thought it looked like something I could do, and I managed to apply for an interview the next day. So it all started by a joke from your friend? T: It was only half a joke. More like ‘Let’s do it, why not?’ For me it looked like a nice job to do because it’s very physical, and I like to have a healthy way of life (not that I’m into bodybuilding or running a marathon though). It just looked good, you know! I wanted to do something physical, something different. How was it to start working as a rickshaw driver? T: I started this job in 2008. I started working near Kiyomizu temple, a very hilly place. I would go up to the hill, down the hill every day. It was a really physical job. But after I started doing this job, I found it actually very fun, because after the ride the customers were truly happy. It was really different from everything I had done so far. Before that, I did other jobs like working in a restaurant, but I didn’t feeI I was making customers as happy as I do today. The people who work with you, do they have the same kind of story, the same reasons? T: I think so. Some of them are students… I have an interesting story to tell you! You know, people from our company have been doing this job for 26 years and started in Kyoto. There were only 3 rickshaws at the time. And so there’s this boy, who grew up in Kyoto around rickshaw guys. He was dreaming about the rickshaw, about being a rickshaw man. And nowadays, he’s doing this job too! Some people have very romantic stories like that. But for me, it was more a matter of luck. You said you started this job in Kyoto. How did you end working here in Asakusa? T: When you do this job, it’s good for your experience to do it in several locations. I started in Kyoto, then I went to Kyushu in Oita prefecture, then back to Kyoto, then to Hokkaido, and here in Tokyo. It’s a whole journey! At the moment, Asakusa needs someone who speaks good English, and that’s why I’m here. I love every place I’ve worked in as a rickshaw, but Otaru in the summer felt like heaven compared to the terrible heat in Kyoto. T: It depends on the location, but in Asakusa we start mainly at 9 o’clock in the morning, and we finish at 4 or 5. The number of customers depends on the day; if it’s raining or snowing, we don’t have as many customers. On a normal day, I guide about ten people. The minimum trip is one kilometer, and it goes up to 2,3,4 hours or more. We wear pedometers, and I do from 30 thousands to 40 thousands steps a day, that’s about 20 or 30 kilometers. Basically, my job is to run around! (He laughs) But I stop and give explanations at each point of interest or sight. I also take pictures of the customers at good places. Our main purpose is making the people who come to Asakusa happier, give them good memories about their trip in Japan, and especially of this town, Asakusa. But you do all this while pulling very heavy stuff! By the way, how heavy is a rickshaw? T: A rickshaw is about 90 kilograms without passengers. If there are passengers, it’s about 200 kg. But you know, it’s not as hard as it seems. In Asakusa, we even have 5 female drivers at the moment. It’s a bit rare, so they’re very popular among our customers! (He laughs). What’s the heaviest you can pull? T: About 260kg maximum… You know, since a long time ago, all the rickshaw men talk about it and share their stories about how much they can pull. Everybody is talking about 250 or 260 kilograms. You know, a rickshaw is not very large, because it was made for the bodies of Japanese people from the Meiji period. Sometimes it’s hard to fit in. I remember two customers I had in Kyoto one day. I think they were twice my size, and their hip was sitting on the arm rest! But I did a 30 minutes ride with them and it was amazing. They were very happy too. What are the good sides and the difficult sides of your job? T: It’s pure fun! It’s always hard to explain to people who have never done this, but I feel really good meeting the customers and offering the most satisfying ride possible. Also, I love Asakusa and I want to share the stories of this town. That’s the good side. On the other hand, the bad sides… (He pauses and reflects for a moment). When it’s pouring rain or snow, and we have to wait because we have less customers. In Asakusa, we never have a day without customers though. Speaking of the bad sides, it’s a famous fact that being a rickshaw driver was considered the most dangerous job during the Meiji period, because they were many accidents. Is it still a dangerous job? T: (He laughs) No, not at all! I know rickshaws at the time were very proud of their jobs. They would run from Ueno to Nikko [AN: that’s about 110 kilometers] in 14.5 hours. That’s really fast and something to be proud of! Nowadays, you have to go through training before becoming a rickshaw. You’ve got to get the technique to be able to talk and run at the same time. At EBISUYA, the training takes about a month, and then you must pass two exams, a technical one and a knowledge one, before we are allowed to become rickshaw drivers. The first thing you must be able to do is to stop the rickshaw in case of emergency because people, especially kids, can get in the way very suddenly. Also, when you turn left or right, you must be able to see everything. You cannot allow yourself to be distracted, even if you are talking with the customer and having a good time. It sounds really complicated. How do you learn to do this? T: We have a great teacher. He has about 20 years of experience, knows everything about the job. He will ride the rickshaw and point out your mistakes. It takes about a month. What can you tell us about the origins of the rickshaw? T: At the end of the Edo period, a new world was coming. Before, the country was completely shut, and we opened the door. Before that, our culture was very slow. No steam engines. Also, Japan is a very hilly place, 70 percent of Japan is mountains. For horses it was also difficult to go into narrow streets and everywhere. So the rickshaw appeared to be very convenient to go everywhere, far or near. Rickshaw appeared at Nihonbashi, “Japan Bridge”, around 1869, and customers were a bit exclusive people, like doctors or geisha girls. So basically, when you ride a rickshaw, you can feel like an important person from the Meiji period. T: (He laughs ) Yes, something like that! But if you ride it, you will experience something completely new. There’s no engine, but it’s not like a bicycle either. It’s a completely different feeling. You drive rickshaws, but do you ride them too? T: Of course! Here in Asakusa, but also in other touristic places. If I see a rickshaw I go straight to him! So why did the rickshaws go out of fashion? T: Well, I think time has passed. The streets got more organized and wider. People got richer, they started driving cars. And rickshaws were slow in comparison. They couldn’t win against the taxis. Today, what are the advantages of visiting a place in a rickshaw? T: I think riding a rickshaw changes your perception of doing sightseeing. You’ll remember all the places, like the Sky Tree or the Kaminarimon and Asakusa, but as you have seen them from the rickshaw, which is very different from walking around. The other thing is people. I personally love going on trips and do sightseeing. I don’t always remember the buildings, or the gardens and things like that. But I remember the people. So, the most important thing is communication. Having someone to talk to, in Asakusa, about history, or about yourself. So by riding a rickshaw you just don’t do sightseeing, you can meet real Japanese people. T: Yes! And we really know the area, so each one of us has personal recommendations about nice restaurants or places to go. The information we give our customers is not like reading Wikipedia. We care about how you know things, because our main goal is to raise interest. I’ve read a lot about the Asakusa and I have a lot of knowledge about its history, but I adapt what I tell my audience. Elder people, younger people, little kids, I tell them all different stories. People tend to remember funny stories more easily. For example, if I say “That’s Kaminarimon, and it’s very old”, this kind of things, they won’t remember about it. But if I say “This is actually very new, 57 years old, it was rebuilt. And it’s the founder of Panasonic, Mister Matsushita, who rebuilt this gate”, then they’ll remember. What’s your favorite story about Asakusa? T: Wow! There are a lot of stories actually. (He pauses and ponders for a long time.) You know, before Mister Tokugawa came to Tokyo, it was the sea here in Asakusa. When he came and reclaimed this land, Asakusa was nothing but a small fishing village. One day, two brothers went net fishing, and they caught a piece of stone, something like this size (he shows a length of about 6 centimeters with his fingers). That was a Buddha statue. And that became the foundation of Asakusa’s Sensoji temple. It’s a big temple, maybe the biggest temple in Tokyo, but the Buddha statue is only this size. So that’s why we cannot see the statue! T: No one can see it. What else makes Asakusa special compared to other parts of Tokyo? T: Tokyo is a big city with a lot of different ‘towns’ in it. If you look at places like Roppongi, Shibuya or Harajuku, they are all well organized, each street has its pretty restaurants and clothes shops. But here the old and new is really mixed up. You know, I started this job in Kyoto, where everything is ancient. Here, it’s also ancient but it’s mixed, it’s chaos. And Asakusa has lots of festivals! I’d say there’s a different festival taking place each month. But most of all Asakusa has its unique people. The locals are very funny, I love the people here. I walk around and I say ‘Konnichiwa’, ‘Konnichiwa’, ‘Konnichiwa’, at each block! The people who live or work here, they say hello to me every time. Even when I have customers, they greet me and ask where I’m going. It’s interesting because when a place becomes touristy, people tend to get colder and there is some kind of competition between people. T: Well I think there must be some kind of competition, even if I don’t know much about it. Still, if I say hello to little kids, and they don’t answer because they’re shy, their mom will scold them! People here keep the old Japanese discipline and culture of good manners between neighbors. Do you have any secret places in Asakusa? T: From next month, two very nice cherry blossom trees are going to bloom. Everywhere you go, you’ll only see branches, no leaves. But I know where to see these trees. I have my secret spots for every season. I still explore Asakusa. When I go back to my house, I go cycling around to find new places. I make new discoveries all the time. You know, on the internet, everybody’s praising how well EBISUYA’s drivers know the area, but also the quality of their English. You do speak really good English. Have you been studying for a long time? In your job you meet people from all over the world, which must be very enriching. Did you have any specific experience that left a strong impression on you? T: (He thinks for some time). Well, there were two people. In wheelchairs. I think they came from the United States. It was a really sunny day. So I told them ‘Hello! Why don’t you take the rickshaw, it’s so much fun!” and they said “Okay”! But actually, they could not really speak [due to their handicap], and it was difficult to communicate with them. They might not have understood all I was saying. And also, the girl… she couldn’t see. But once they rode the rickshaw, they looked impressed. They could feel the wind, and also the [earth’s] gravity when I was running. I did my best to communicate with them, taking photos and explaining. I have lots of customers every day. But making them happy is not just about talking and words. After that experience, I loved my job even more. (He pauses.) I also have another story, actually. T: Three months after I first I started this job, I think I was 25 or 26… it was summertime. And there was this family. A grandma, her daughter and her son. So I was near Kiyomizu temple in Kyoto, and as I told you, there is a slope. They said ‘Only go up, just 10 minutes!’ But actually, we must respect for the temple, so we cannot stop exactly in front of the gate and the steps. So I told them that if they wanted to get there quickly, walking would be better. But they said ‘It doesn’t matter’. Only the Grandma took the rickshaw, for just a 10 minutes trip. So I did my job: I went up, I taught her to do the Japanese peace sign on the photo, how to say hello… and then I wished her goodbye. A few days later, I got a letter, from the daughter. It said “Thank you very much for the other day. My mother was very happy. Actually, my mother is in the hospital at the moment.” The Grandma had a serious illness and she was in a lot of pain, but she could not decide if she wanted to have surgery or not, because she might not survive. It was like fifty-fifty. So they took her to Kyoto to make her feel better. The letter said “She took the rickshaw, and her rickshaw driver (me), was very happy, very lively… And in the end she decided to have surgery. Thank you very much.” I read that and I thought “Oh my God. I have to take this job very seriously. I changed her life.” I’ll always remember this customer. I also have a picture. I sent a letter back thanking them for the ride and wishing her the best. But I don’t know what happened after that. Oh… that’s a wonderful story… I hope she’s fine. T: Yes, I hope she’s fine… But you know, each rickshaw man has stories like that. First of all, thank you very much for having an interest in Japan and for reading this article. Japan has a very different culture, lots of history, and nice food…The world is very big and there are interesting spots all around the world. So I’ll be very happy if you have an interest in Tokyo and Asakusa. If it’s the case, then, really, really, thank you very much. And I hope you’ll have a really nice time when you come to Japan and Tokyo someday. EBISUYA is a famous rickshaw company that operates tours in Asakusa (Tokyo) but also in Kyoto, Hokkaido, Miyajima and many other places (click here for the full list). Their prices are based on the time you spend on the rickshaw, starting from 12mn (to have a short experience) to a full 180 minutes guided tour! I recommend doing it with 2 people to get the most out of the ride. EBISUYA has several English speaking guides but tours can also be offered in other languages – but it might be better to enquire and book in advance. Do not hesitate to contact them through their official website – they are very responsive. Many thanks to EBISUYA and especially Ms. Corriveau for making this interview with Mr. Taira possible!